Green screens for the garden offer an attractive alternative to regular fencing. Sometimes referred to as living walls and fences, garden screening is the perfect solution for spaces requiring an aesthetically pleasing perimeter or partition providing privacy and security. These alternative green, living screens are as simple to install and maintain as the ivy screens, due to being grown in the same way. As a sustainable living fence or wall, theyre ideal for covering unattractive areas, or for use in narrow spaces, as well as being secure and environmentally friendly, absorbing pollution and carbon dioxide from the air around your home. One of the most significant advantages to garden green screening is that theyre an instant, cost-effective solution to common problems with long-term use and attractive appearance. They can be used to great effect in both residential and commercial environments. 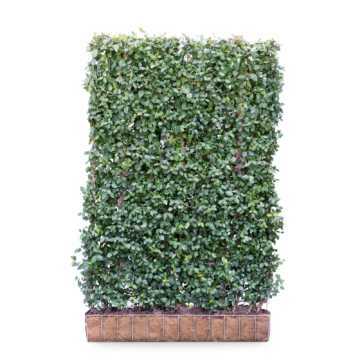 Hedges Direct has a range of green fence screens available in a variety of species. Theyre grown on galvanised steel frames and offers full coverage, all with different characteristics and aesthetics. Our range includes Hornbeam, Beech, Euonymus and Pyracantha green screens.